Welcome to the summer American Astronomical Society (AAS) meeting in San Diego! A team of astrobiters is attending the conference this year, and we will report highlights from each day here on astrobites. If you’d like to see more timely updates during the day, we encourage you to follow @astrobites on twitter or search the #aas228 hashtag. We’ll be posting twice a day during the meeting, so be sure the visit the site often to catch all the news! Galaxy Zoo was so hot that the servers hosting the galaxy images got melted down soon after being launched. Kevin Schawinski from ETH Zurich took us on a tour in his wonderful Galaxy Zoo. It is a huge zoo with about a quarter million zookeepers, they are citizen astronomers who collaboratively classify galaxies by their looks as an attempt to understand galaxy evolution. The big question that is being answered is: how do blue, actively star-forming galaxies evolve into red, quiescent (non-star-forming) galaxies? The Zoo helped reveal that blue galaxies turn into red galaxies via two possible paths – galaxies might run out of supply of gas and shut off star formation slowly; or they could merge with one another and turn off star formation by destroying the gas reservoir rapidly! The idea of Galaxy Zoo in getting help from citizen scientists was further extended into an award-winning project known as the Zooniverse, which is an online platform for streamlined crowd-sourcing for scientific research that requires human input. The future of astronomy is going to be extremely data-rich. The Galaxy Zoo project also suggests the promising prospect of synergizing the help from citizen scientists and machine learning in analyzing extremely large datasets. Antonija Oklopčić (Caltech) explains that Raman scattering of light, which works similarly to Rayleigh scattering (the process that makes Earth’s sky blue), can be used in the future to study the atmospheres of exoplanets. Her work is to create model spectra containing these features, from which we can learn about the presence and altitude of atmospheric clouds. Dr. Carl Melis (University of California, San Diego) studies the inner composition of exoplanets by looking at their remnants after they are destroyed by a dying star. His most recent work suggests that there is a differentiated pollution (from the core and the crust of a planet) in the disk orbiting of a white dwarf star. Samuel Grunblatt (University of Hawaii) introduces us to the main subject of his thesis: a hot Jupiter observed by Kepler’s K2 mission transiting a red giant star. They used some pretty tricky data analysis in order to filter out the noise intrinsic to this type of star, and found the planet was likely inflated in size as a result of its host star’s evolution. Grunblatt shows the K2 transit before and after removal of granulation effects. Avi Shporer (JPL) asks the question: why are hot Jupiters so large? His research aims to study the correlation between stellar irradiation and planetary radius, and in order to have a more complete picture, they need to detect more gas giants on lower stellar irradiation regions. This idea gave rise to LCOGT K2 Warm Jupiter project, which recently discovered a brown dwarf in a long-period orbit around a Sun-like star. Paul Mason (New Mexico State University) proposes that the Milky Way is evolving to a more habitable galaxy, due to the expansion of the universe, the processing of heavier material inside stars, and the general decrease of ionizing radiation. Tuesday morning’s panel on the lifecycles of galaxies began with a talk by Ben Cook (astrobites author) on how we can infer whether a galaxy experienced large mergers. Cook used the Illustris simulation to study how stars are left in so-called “stellar halos” far outside galaxies after they have large collisions. Yicheng Guo then showed evidence that lower-mass galaxies tend to form their stars in a few large bursts, rather than long, steady formation like in more massive galaxies. 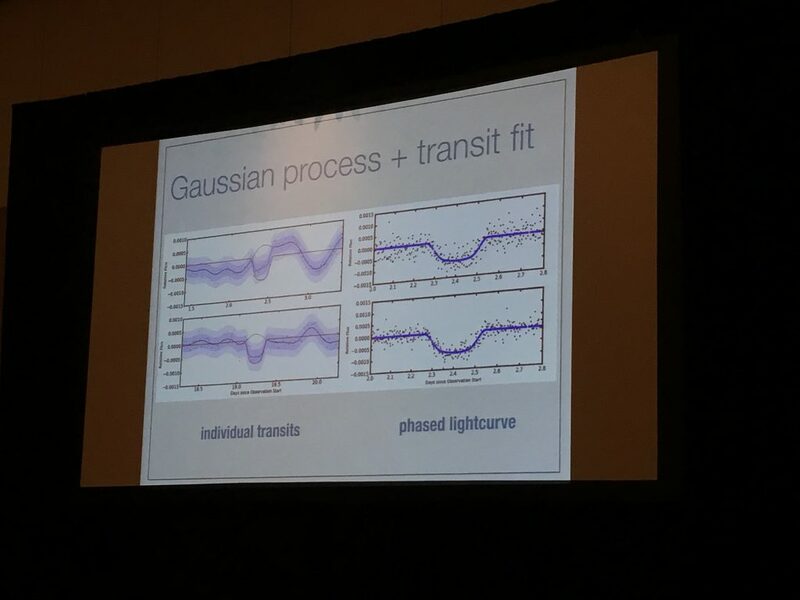 Ali Khostovan measured the strengths of particular emission lines, which are found to increase further back in time, telling us that galaxies were forming many more stars early on in the universe than they are now. Irene Shivaei presented a new measurement of the relationship between the star-formation rate of a galaxy and the mass of its stars (i.e., its stellar mass). This relation has been measured to have very different values by a large number of different studies! Gene Leung look at the spectra of Active Galactic Nuclei (AGN) and found that many of them are blowing out large blobs of gas into the space around their host galaxies. This process is an important part of how we think galaxies shut off their star formation: the AGN blow the gas far away, so it cannot collapse and form new stars. Rui Xue studied large glowing halos of Lyman-alpha emission that are seen around high-redshift galaxies. This emission is lighting up the gas around each galaxy and can be used to measure the “circum-galactic medium,” the stuff around galaxies extremely far away. SungWon Kwak ran new simulations to study how small (dwarf) galaxies can form central bars or spiral arms when they fall into clusters or collide with other galaxies. Dusan Keres closed out the session by talking about a new, very powerful simulation called FIRE, which uses very complicated star-formation models and tries to model galaxies with as high resolution as possible. Although astronomers are building larger and larger telescopes to study the farthest reaches of space, recent advances in camera technology are opening the gates for backyard enthusiasts to explore cutting-edge science. Dave Rowe opened the session with a short talk on a technique called speckle interferometry. In short, this technique takes many quick (short exposure) images and averages them using the Fourier power spectrum of the images. This technique lets you separate stars a half arcsecond apart on the sky, or about 1/120th the size of the moon, for a few hundred dollars! Next, Dominic Ludovici explained how his research is bridging the gap between professional and ameateur spectroscopy by utilizing instruments called collimated grisms. Using custom 3D-printed parts, Ludovici is able to take high-quality spectra of everything from Wolf-Rayet stars to quasars for only a few hundred dollars. These tools allow Ludovici to bring science into his college classrooms at the University of Iowa through a series of hands-on observing labs. Virginia Trimble wrapped up the session with some thoughts on communities of practice and collaborations. She underscored the importance of creating an open and welcoming environment for incoming members of any collaboration, and she emphasized that we should build communities of inclusion. Tuesday morning’s press conference highlighted two new papers. First, Brandon Carroll from Caltech and Brett McGuire from NRAO presented the first detection of a chiral molecule, propylene oxide, outside our Solar System. Chirality, or “handedness,” is a special property of some molecules that are found in one of two mirror-image versions. Chiral pairs generally have the same properties but different kinds of physical interactions. Biology has a tendency to prefer sugars and proteins that are one chirality only, but it is unknown whether this is a universal preference or a quirk of Earth-based life. Carroll and McGuire’s new detection in a star-forming cloud of material near the center of the Milky Way does not distinguish whether the propylene oxide is left- or right-handed, but it does show that the cosmos is capable of producing complex molecules that are essential to biology. In the future, they hope to use polarized light to directly measure chirality. Next, Joel Green from STScI presented how a young star surrounded by a bright protoplanetary disk, FU Orionis, has changed since a bright outburst in 1936. Since then, it has consumed some 80 Jupiter’s worth of material! By comparing observations of the disk’s brightness taken twelve years apart, Green showed that the hottest inner regions of the disk have faded significantly while the cooler regions farther out have not. In other words, the star has consumed the hot parts of the disk closest to it and altered the chemical composition in the disk that remains. This is likely what our own Sun experienced as a young star, and has implications for planet formation because the chemical composition of the disk affects what materials are available for forming planets. Green hopes that future observations with the Webb telescope will complement existing Spitzer and SOFIA data.